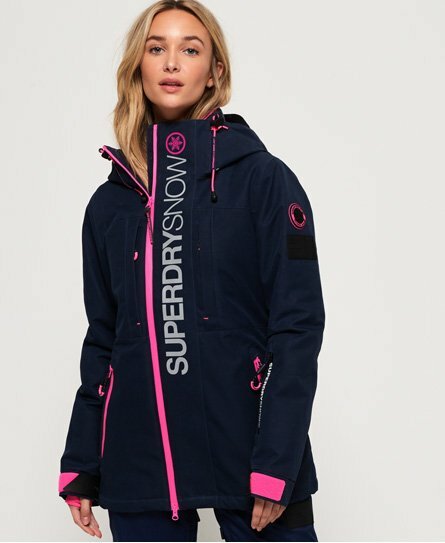 Superdry women’s SD Multi Jacket. This versatile 3 in 1 jacket is the perfect all season ski attire. This jacket features a water resistant outer shell, with a removable inner quilted jacket for extra warmth and comfort. The outer jacket features a bungee cord adjustable hood, hook and loop adjuster cuffs, four zip fastened front pockets and a ski pass holder. Zip fastened vents under the arms will help to keep you cool and the snow skirt is great for keeping the snow out and warmth in. The jacket also features an inside media pocket. The quilted inner jacket features zip fastening, two front pockets, and is attached to the outer jacket with zip and popper fastening. The SD Multi jacket is completed with Superdry Snow badges on one sleeve and a reflective snow Superdry logo down the chest.